Mika had been taken as a chick and raised in a private home for the first two years of her life. Because she was not being properly cared for, she became malnourished, had little muscle mass and was imprinted on humans. In 2012, Mika was surrendered to Stark Parks, who immediately brought her to the Medina Raptor Center so that she could find her new home and be happy. She is a fantastic educational ambassador for her species and loves showing off at programs. 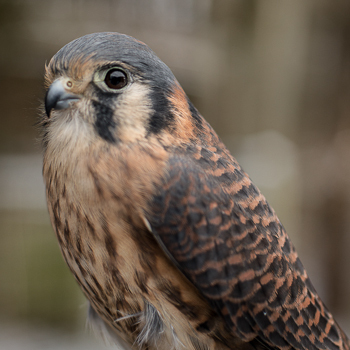 Perhaps the most colorful raptor in the world, the American Kestrel is the most common falcon in North America. It is found from Alaska to Tierra del Fuego, and in towns as well as wild lands. Two dark mustache marks on face. Short curved bill with “tooth” on upper mandible. Legs and toes rather short. “Eye spots” on back of head. Streaked or spotted on chest. Male: blue-gray wings and a lightly spotted chest and belly. Female: larger with rufous wings barred with black, and streaking on the chest. Breeds from Alaska across most of Canada and the United States into Central and South America. Winters in southern portion of breeding range from Canadian border and northern Nebraska and Ohio southward. Breeds in a variety of open habitats, including meadows, grasslands, deserts, parkland, agricultural fields, urban and suburban areas. Loud series of “klee-klee-klee” notes when excited.